This is part 1 of a 4 part series on rats. This article will focus on their environment (housing). The next three will center on proper diet, things to think about when choosing a pet rat, and how to best insure their health & well being. Here are some environmental things to keep in mind as when considering what it takes to successfully care for pet rats. What size enclosure should I have for my rat(s)? The general consensus seems to be that in rats, the more room the better. There are minimum space requirements that depend on age, health, etc. Other than that, the sky is the limit! 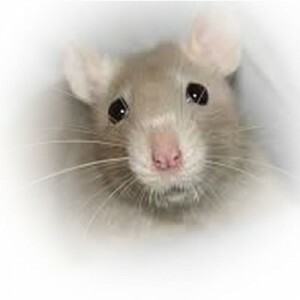 Minimum size (for 2 adult rats, more if more rats in pack) should be 24″ x 36″ x 24″. Younger rats like to explore and climb so multiple levels is recommended for them, however as they age it may be harder for them to get up and down ramps and stairs so it may be a good idea to house your older rats in a one story dwelling. Does it matter how far apart the wire mesh is? An important note when choosing your rat’s new home, is to look at the spacing of the wire mesh. Feet and tails should be able to easily be brought back inside if they get pushed through the bars. Powder coated mesh is fairly safe for most age categories, and relatively easy to clean. Rats are pretty smart, but even they can get hurt if their foot gets caught. Something that should be avoided is a wooden pen. Wood absorbs moisture, rat urine for example, and is difficult to clean. Anything that cannot be put in the washer or soaked in disinfectant should likely be avoided. Are there other things to avoid in my rat’s enclosure? Some other quick tips on what to avoid in your rat’s cage are: no sharp edges, rats can and probably will cut themselves : aquariums, they do not allow for enough air flow, while you don’t want your rats catching a chill they need to have circulated air : wire mesh flooring, this can cause many problems, toes getting stuck, sores, and a condition called Bumblefoot which is actually a buildup of bacteria that is treatable but could take a very long time depending on the circumstances. Do we have to buy a cage from the pet store or can I do it myself? You can also build your own! There are many plans out there on the internet depending on your living space needs. Just find one that works for you and be creative. A good suggestion from someone else was to make sure the doors are easy for you to either reach through with your arm or fit your upper body into to make cleaning less of a hassle. What kinds of things can I put on the inside of the habitat that are non-harmful to my rat(s)? Now that we’ve covered the functional part of your rat house, let’s get to the fun part : INTERIOR DECORATING! We all love to buy things for our pets, rats are no exception. Hanging tents, hammocks, tubes, beds designed for it at the pet store are all great ways to spoil your pet rat. Some other things to keep in mind are parrot perches made like a branch are great for climbing, cardboard tubes are great fun to tunnel through or sleep in, and boxes. Boxes are good because they can serve multiple uses. Cutting doorways into them allows for the rats to go from room to room and still be concealed. Make sure to remove tape, staples and food residue before allowing your rat access to the box. Toys & chew toys appropriate for rats, a litter box or two, bedding (soft t-shirt material or fleece are favorites) and a wheel. Some rats take to the wheel right away, others may not use it at all. If your rat seems hesitant at first but decides to go for it, make sure to praise them. Everyone likes to be cheered for, acknowledge their hard work and bravery. And most of all, have fun with it. Your rats are going to be living in this home for the next several years, if you are happy with it, they will be much happier as well. Be sure and read parts 2, 3 and 4 for a more comprehensive understanding of how to properly care for pet rats.